Telephone Entry Systems and Intercom Systems are a method of access control that allows you the ability to talk to the individual before letting them through your gate. Residential Telephone Entry Systems often us the same phone line as the residence. The entry system will ring your home phones allowing you to decide to let your guest through the gates or not. Most of these systems can call up to three pre-programmed numbers and the gate can be controlled remotely by phones anywhere. Commercial Telephone Entry Systems use a dedicated phone line. These entry systems are designed for gated communities, apartment building, and other multi-user situations. They can keep records of individual users and can incorporate card readers, proximity sensors & transponders. The DoorKing 1802 and 1802-EPD (Electronic Programmable Directory) are ideal telephone entry and acc.. 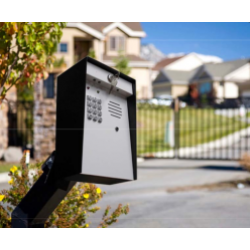 The Doorking model 1803 is an ideal telephone entry system that is loaded with features and is suite..
Talk to your guest at a front door or gate from any telephone in the home!Up to 27 resident / tenant.. Provides service for up to 1000 residents. Led lighting illuminates keypad and directory Flash ent..
One button voice communicationManual internal keypad programming10 and 11 digit dialing capabilityBu..
Doorking 1835 PC Programmable Telephone EntryBig characters half inch LCD displayStainless steel pla.. Display characters are easy to readStainless steel plate and anti-vandal features protects all inter.. The ECGO-GKP is a cellular telephone entry system with a keypad, that can be installed at the entran.. The ECGO-G is a telephone entry system, that can be installed at the entrance of a building or outsi..